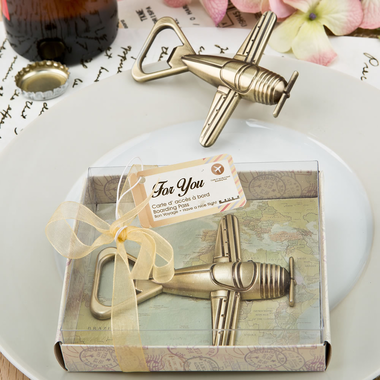 How perfect are these airplane party favors for a pilot retirement party or destination wedding? Vintage travel theme party items are hard to find, however we found this beautifully crafted piece at an affordable price. The opener measures 3.25" x 3" and is constructed from metal, molded in the shape of a classic airplane with a single prop in the front. It has an antiqued brass finish and comes packaged in a presentation box with coordinating ribbon, bow and a general use "For You" tag.